Many terms used in the delivery of financial advisory services are undefined. The imprecise nature of terminology and titles among financial advisors makes it difficult for investors to know which advisors to use and what services to expect. One of the chief ambiguous terms is “wealth management”, a popular selection of words used by advisors and providers to offer a wide spectrum of services to a wide variety of investors. But one advisor offering wealth management services could provide a significantly different set of services than another advisor who also identified as providing wealth management. The non-specific nature of wealth management is the topic of Spectrem’s study Defining Wealth Management, which asks investors to explain just what “wealth management’’ means to them. One significant result of the study is that retired investors are more likely than non-retired investors to believe “wealth management" refers to them and their needs. How demonstrative is the difference in impact of the words “wealth management’’ between retired and non-retired investors? Eighty-five percent of retired investors with a net worth of at least $100,000 (not including primary residence) claim to understand the term “wealth management’ and 37 percent of retired investors claim to receive wealth management services from their advisor. 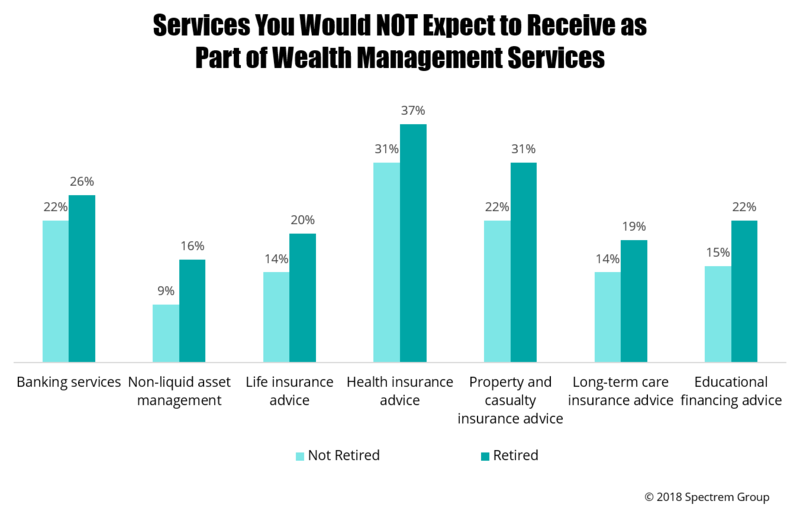 Only 32 percent of non-retired investors believe they are receiving wealth management services. Three-fourths of retired investors believe “wealth management’’ services apply only to those people with $500,000 of net worth, excluding those investors who are not at that wealth level. But only 6 percent of retired investors believe wealth management is for investors wealthier than they are, while 13 percent of working investors feel that way. That indicates that “wealth management’’ is more inclusive among retired investors, at least in terms of perception. Fifty percent of retired investors believe wealth management services are appropriate for their needs, another instance where the percentage of retired investors is higher than the percentage of non-retired investors. Another example is that only 31 percent of retired investors believe “wealth management services” are too expensive for the services they need, while 40 percent of non-retired investors believe so. Do retired investors require more services? Are services provided to retirees more expensive than those provided to non-retired investors? Probably not. Again, the perception is beneficial to advisors working with retired investors. Similarly, 62 percent of retirees believe their asset level qualifies for wealth management services, while only 47 percent of non-retired investors believe that. And what about specific services that fall under the “wealth management" umbrella? Retired investors are much less likely than non-retired investors to believe insurance advice is a part of wealth management services. For example, 37 percent of retired investors believe wealth management should not include health insurance advice, while only 31 percent of non-retired investors believe that. More demonstrably, 31 percent of retired investors believe wealth management should not include property and casualty insurance advice, while only 22 percent of non-retired investors believe so. (This belief in the scope of wealth management services among retired investors extends to other topics. Twenty-two percent believe wealth management services should not include educational financial advice, well above the average). For advisors who provide wealth management services, this is a good news-bad news story. Retired investors are more likely to access your services because you provide wealth management, but they are going to have different expectations of the services you offer as a result of your service title.